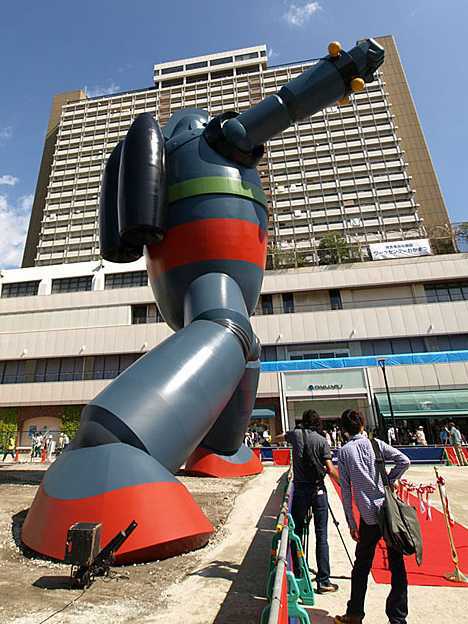 Can a giant robot save Japan? Yes, yes it can! 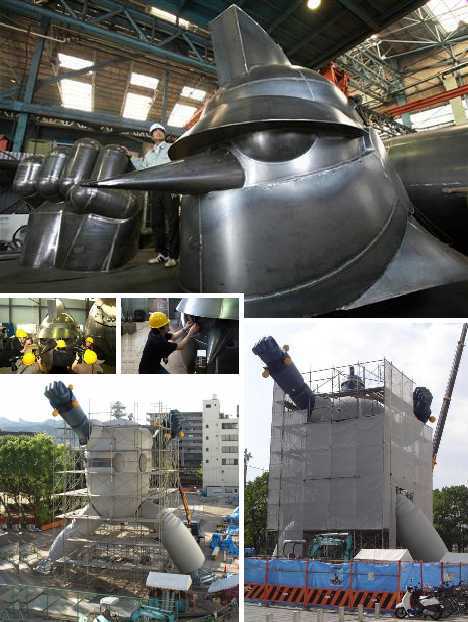 Well, sort of… in the city of Kobe, a 50-ton statue of Gigantor standing nearly 60 ft tall was built to spark and symbolize the city’s recovery in the aftermath of the devastating Great Hanshin Earthquake of 1995. Japan has experienced the tumult, terror and tragedy of earthquakes throughout its long history and is known today as one of the Earth’s most seismically active countries. On January 17th, 1995, the Great Hanshin Earthquake struck the central Japanese city of Kobe, causing the deaths of nearly 6,500 people and leaving 300,000 homeless. Livelihoods were shattered along with lives, and as Kobe picked itself up, dusted itself off and embarked upon the difficult task of reconstruction, citizens and city authorities looked around for some symbol of inspiration that could give people hope for the future. They didn’t have to look very far. 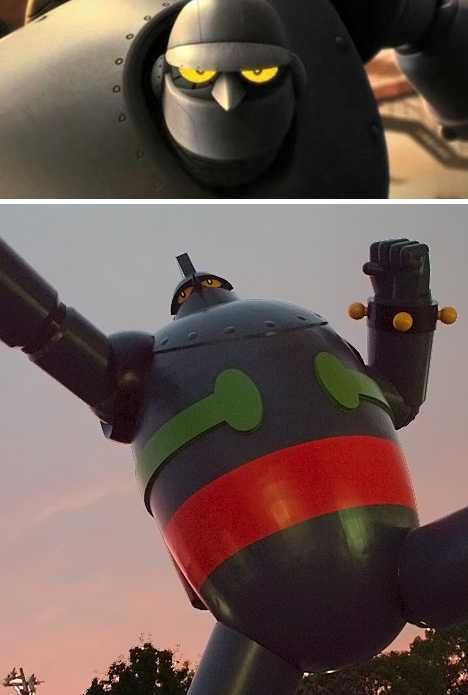 Robots (among other things) are synonymous with Japan’s post-war rejuvenation and one of the most famous heavy metal men hales from Kobe: Tetsujin-28-go! Literally “Iron Man 28”, the robot was the brainchild of Kobe native Mitsuteru Yokoyama and first appeared in comic-book format in 1956. 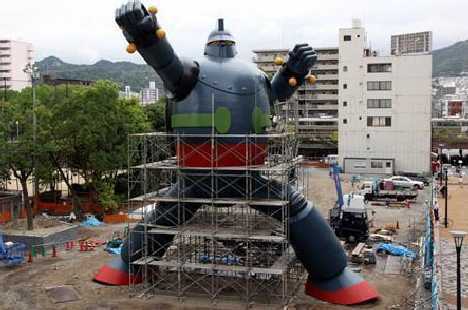 By 1963, Tetsujin-28-go achieved national fame by starring in an animated TV series and in 1966 he made his American television debut, dubbed into English and renamed Gigantor. Mitsuteru Yokoyama (above, right) died in April of 2004 at the age of 69 from injuries suffered in a house fire. Yokoyama’s many fans engaged in discussions of how best to commemorate the artist, his works, and the city of Kobe as a whole. 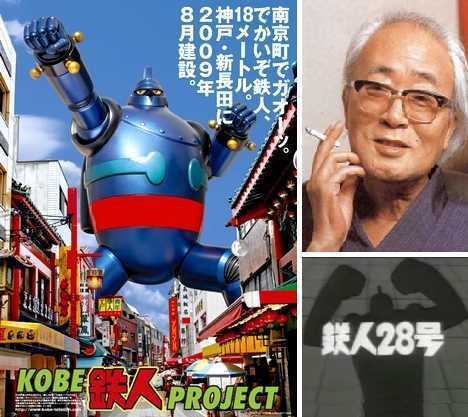 By 2006 the Kobe Tetsujin Project was announced as a non-profit initiative backed by the city of Kobe, local business associations, and manga fans worldwide. 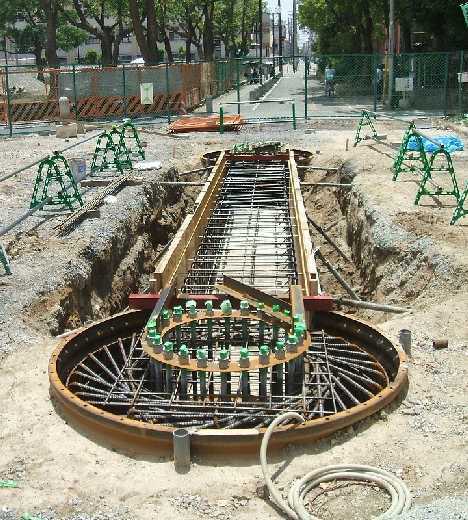 From these various sources, approximately 135,000,000 yen (about $1.6 million) was raised to cover construction and design expenses with the City of Kobe offering space in quake-flattened Wakamatsu Park for the Project’s landmark creation: a “life-sized”, 50-ton, 50.2-ft (15.3 meter) tall statue of Tetsujin-28-go! Once funding was secured and blueprints were drawn up, construction on Kobe’s giant Gigantor statue swung into full gear at a nearby factory. Judging from these images, the builders didn’t fool around. 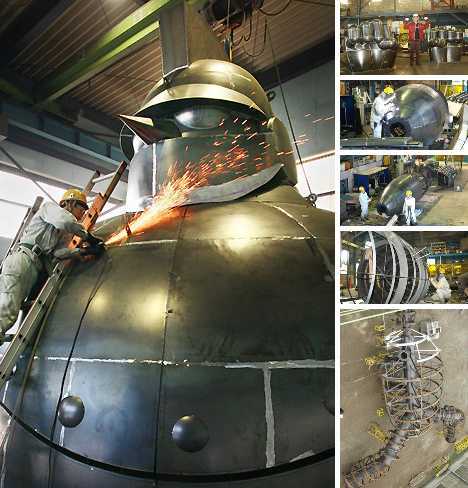 Showers of sparks spilled from welding torches as the massive, all-metal monster slowly took shape. 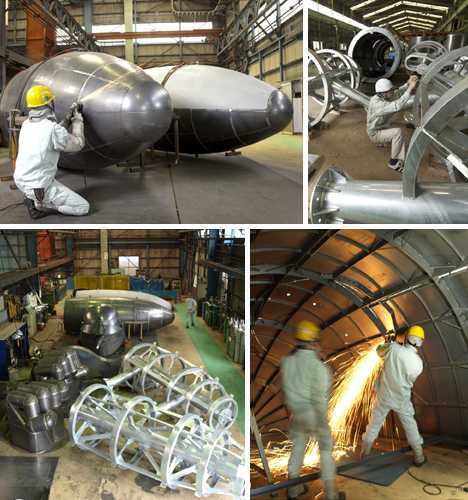 You might be forgiven for thinking Japan had embarked upon a serious rearmament program, what with teams of helmeted and suited workers piecing together steel-ribbed structures looking a lot like aircraft fuselages, submarines and bunker-buster bombs. 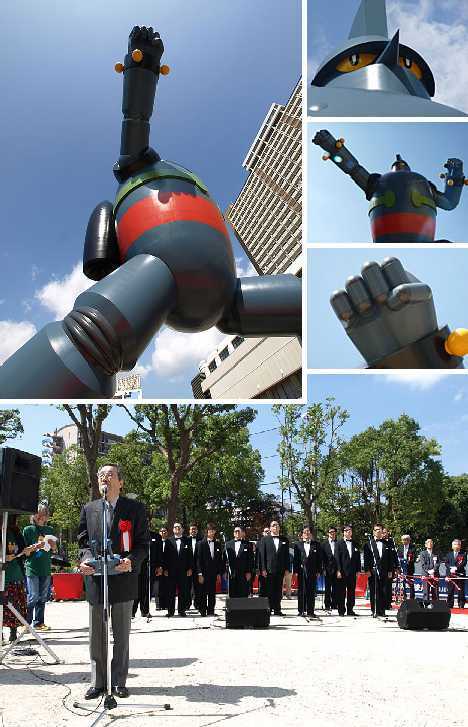 Excitement in Kobe and among the world’s animation fanbase rose in conjunction with scaffolding in Wakamatsu Park as Tetsujin-28-go steadily reached higher and higher into the sky above Kobe. 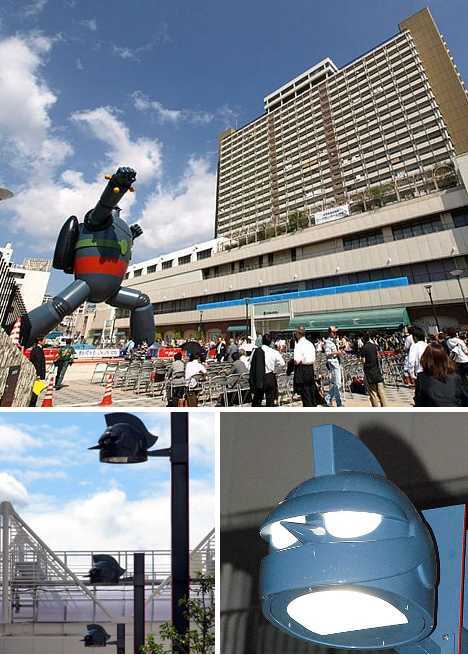 Meanwhile beneath Gigantor’s formidable feet, some serious infrastructure ensures that, quake or not, the menacing metal man won’t take any midnight rambles through downtown Kobe. By the end of September 2009, the finishing touches were being put on both the statue and its permanent home in Wakamatsu Park. The latter was repaved with interlocking stone and lighting (until 9:30pm each night) was provided by themed streetlamps designed in the image of the robot’s head. The big day finally arrived on Sunday October 4th. Builders, luminaries, entertainers, fans and ordinary citizens assembled for a gala ribbon-cutting ceremony. 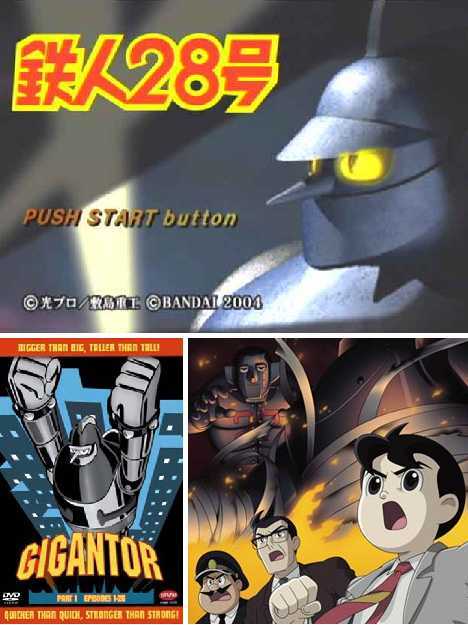 The climactic moment occurred when 78-year-old voice actor Minoru Yada, who spoke for Tetsujin 28’s fictional inventor Dr. Shikishima in the original TV series, shouted out “Tetsujin-28-go!” while holding a mockup of the robot’s remote control operated by Shoutarou Kaneda (Jimmy Sparks). 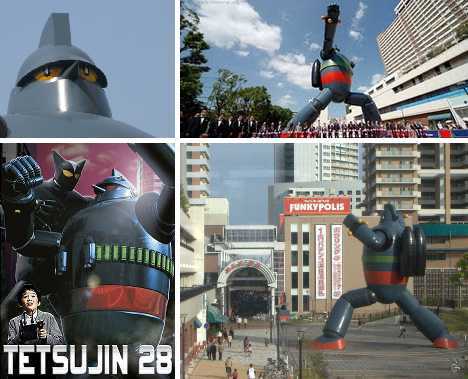 It was a great day for Kobe and for appreciators of giant robot culture everywhere… but Tetsujin-28-go’s work was far from done. As a symbol of Kobe’s resurrection and revival, Gigantor had to do more than just “be”. Step 1: Build giant robot. Step 2: Publicize giant robot. Step 3: Profit? Wakamatsu Park is easily accessible via the Shin-Nagata train station in Kobe. 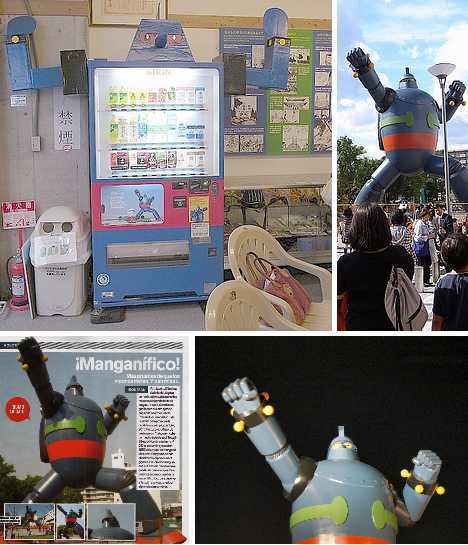 In addition, the city has authorized a couple of taxicabs to be decked out with Gigantor decals, full sets of the Tetsujin-28-go manga for passengers to peruse and imitation remote controls for the kids. All that’s needed are people to come, see and conquer with their hard-earned yen, euros and dollars. The hype and press may be working, as about a million people visited Kobe expressly to see the statue during the first 3 months after it was opened to the public. 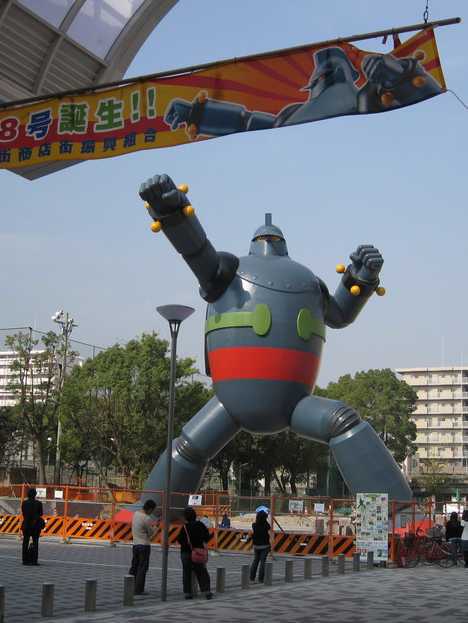 The visitors have made a positive impact on a nearby shopping arcade, many of whose vendors are moving significant quantities of Gigantor-themed merchandise. 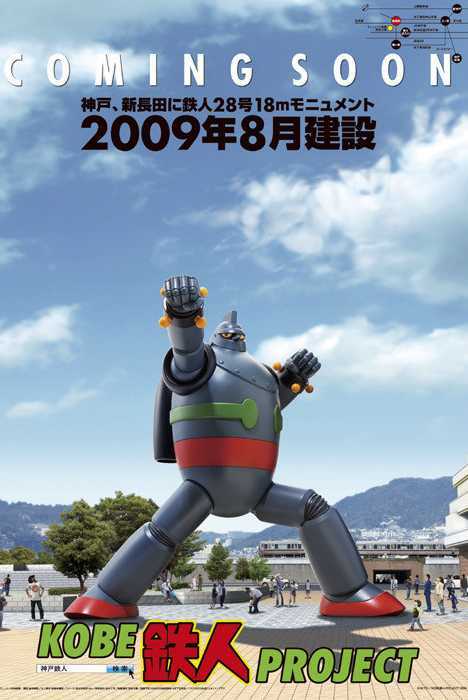 According to Japan Probe, the economic impact of the Gigantor statue quickly fades the farther from the statue one gets. Maybe the answer isn’t more press, but more statues. Kobe still has plenty of free space and Japan has many, many more manga robots waiting in the wings… a few even HAVE wings. 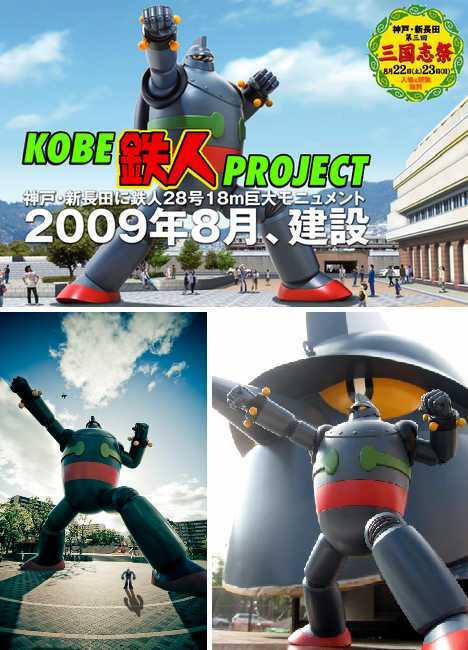 As an economic booster, the use of giant robots has shown only limited success but in the case of Kobe’s Giant Gigantor statue it can be stated confidently that money isn’t everything. The statue has helped boost civic pride while reminding citizens of Kobe’s success in the post-war era. Perhaps government authorities in Japan’s shattered northeast could take a page from Kobe’s book and design a giant statue to watch over the region’s tsunami-prone coastline. 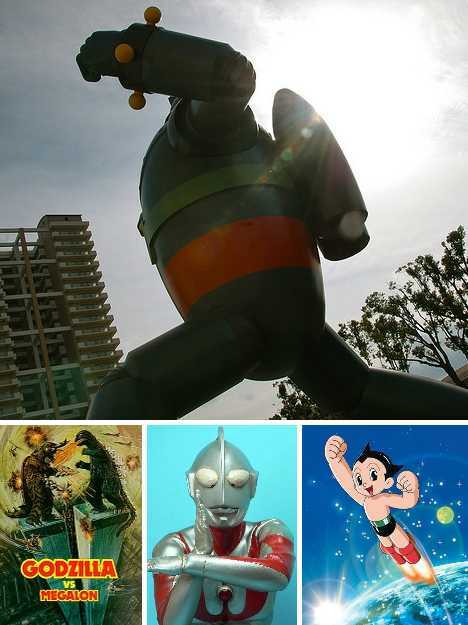 Godzilla, Ultraman, Astroboy, prepare to answer your casting call! Saving Face: ‘Ghost Facade’ Preservation Worse Than Demolition?